Going directly at your patio with a pressure washer can spell trouble if you’ve never done it before. When the goal is to make the area look brand new, very few tools can blast away dirt like a pressure washer. But with all of that extra power comes a lot of choices. You have to correctly gauge which pressure washer will do the job without destroying your patio. And even then, tweaking some settings or making use of add-ons is needed to ensure the cleaning goes well. When Is It Necessary To Use A Pressure Washer On Patios? Homeowners usually bring out the pressure washer when the cement and bricks of their patio have taken a beating. This happens after years of constant use, where even regular light maintenance will make it look worn. For a DIY expert pressure washers to clean the patios, requires hard brush, clean detergent and other necessary stuffs. Spring is an acceptable time to do this since you can incorporate it with the bulk of your spring cleaning chores. You will find this the most fun of the tasks, and also the most fulfilling. Patios play a visual role in home ownership, just like the deck in a backyard. Keeping them in tip top shape requires little effort with the right tools. When you notice weeds, small cracks and other problems with your deck, then it is time to redo it and finish the job with a pressure washer. Size of the patio is something to consider, with the larger size needing a pressure washer that can handle the extra work. The dirtier the area, the more electricity/gas you’ll have to burn to get it looking new again. A small upfront cost of pressure washer is worth the value of having a clean patio. Below are a couple of features to look for when deciding on the best pressure washer for patios. A lot of these features work for multiple projects, so patios won’t be the only use. This flexibility is just another great thing about owning a pressure washer. Differences in how they operate will change based on brand, pricing and the condition of the product. Power Settings – This is the most important feature to look for. Even pressure washers that are considered low power will do fine for cleaning a patio. The problem is when you use a high powered pressure washer that lacks any way to vary its power. It’s a disaster waiting to happen, so avoid using pressure washers that don’t let you control the power. You don’t need anything complex here, just a way to differentiate between low and high power modes. Electric – For many this will be a point of contention, but it is no way saying that electric pressure washers are better than gas. Depending on your setup, there may be a lot of pauses between cleaning the patio. 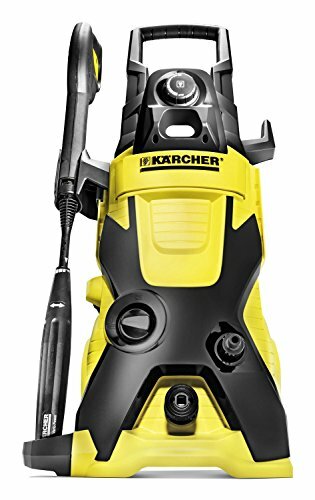 With jobs that require a lot of breaks, electric pressure washers such as Karcher K4. They are equipped to start and stop much faster than their gas counterparts. They jump out of idle mode fast, instantly powering up to the desired mode you require. And when they are not being used, you won’t lose money on wasted gas. Patio cleaning requires moving a lot of furniture and safeguarding areas with weak elements like glass. Since the highest power isn’t necessary, electric will do this job just fine. Multiple Spray Tips – Pressure washers that lack power settings can get by just fine if they have multiple spray tips. Just like with a garden hose, a pressure washer spray tip determines how the water is concentrated during use. This gives you plenty ways to ensure that the patio gets the right amount of water without being too much in one spot. With the right tips, you can do light, medium and heavy patio work. 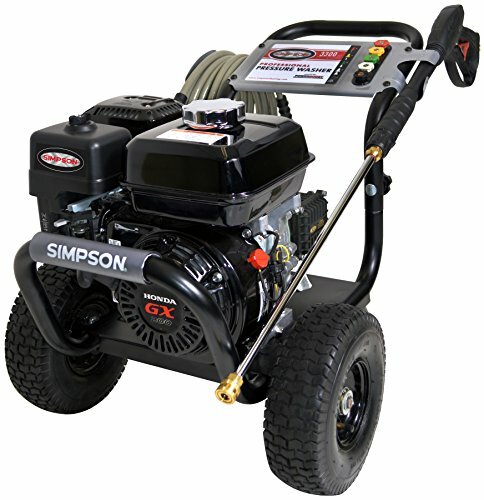 Pressure washers that have power settings and multiple tips all in one package provide the best of both worlds. For that reason, a power/tip package comes highly recommended for patio work. Detergent Tanks – Whether it is dual detergent tanks or a single, these tanks provide a way to better break up stubborn dirt. You can put whatever solution you need in them and it will disperse with the water that’s sprayed. It’s a great way to clean a filthy patio without having to up the water output and risk damage. When deciding on this feature, try to get pressure washers that have removable tanks. It makes blending solutions and cleaning out the tanks less of a hassle. You’ll also have the option of replacing the tank if it gets damaged rather than replacing the entire pressure washer. The best part about a detergent tank of any type is that adding a solution is optional to its operation. Long Cord – Since electric pressure washers are recommended for cleaning patios, having one with a long cord is a must. There is nothing more frustrating than running out of cord when you’re in the middle of cleaning. A short cord can be overlooked with a proper extension when available. But in situations where you have to depend on the pressure washer by itself, a long cord is an invaluable feature to have handy. To see if cord length is to your benefit, measure how far it is from your patio to the closest plug. That should give you a great starting point when making a decision on cord length. Durability – Durability is a no brainer, and there is a reason it is an important feature for patios. In less than an hour you can finish cleaning a patio with the help of a pressure washer. Cleaning the patio will turn into one of the many jobs of a pressure washer over the years. For maximum flexibility, you want your pressure washer to handle heavy usage without too much breakdown over its lifetime. A well-made product in this field can handle a lot of abuse, so choose carefully. A larger upfront cost may guarantee you a long-term investment. Consistent Spray Power – Power settings need to be respected, so random bursts while using a pressure washer points to bad design. This isn’t a big problem with high end modern versions since they are equipped with up to date pressure water pumps. Any pressure washer that uses one of the older pump models will run into this problem. The only way to regulate pressure jumps in the older pumps is by using a really good spray tip. And even then, that is considered a Band-Aid fix. Mobile – It doesn’t matter how big the pressure washer is if you have a good transport system in place. Quality brands put a lot of effort into making their wheels big and mobile. When your pressure washer glides like butter on carpet or brick, then there is less frustration when bringing it from one side of the house to another. Big wheels also help with grip as they glide over wet surfaces and prevent top heavy pressure washers from tipping over. Cleaning your patio becomes an easy project when the correct pressure washer is chosen. With some careful feature selection, you’ll never have to worry about a dirty patio again. Guidelines related to other popular brand tools are available on our website including quality garage door openers with detailed reviews.